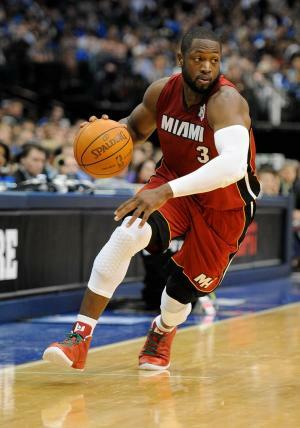 American basketball player Dwyane Tyrone Wade was born in 1982, in Chicago, Illinois, and is best known as a guard for the NBA team the Miami Heat, with which he became a three-time NBA Champion, as well as an all-time leading scorer. He has been a part of the NBA All-Star team 12 times, and held the title of NBA Skills Challenge champion twice. Wade also had the best-selling jersey in the NBA for almost two years, and so has managed to accumulate a respectable net worth. A famous basketball player, how rich is Dwyane Wade, as of mid-2017? Authoritative sources estimate that Wade’s net worth amounts to over $105 million, the majority of which comes from his professional basketball career. Examples are that in 2013, Wade’s salary with the Heat amounted to $18.6 million, while he collected a total of $29 million in annual salary. That year he also purchased several valuable assets, including his Porsche 991, which cost $130,000, and his Cadillac Escalade valued at $87,000. In 2014, Dwyane added $19 million to his wealth from his annual salary and bonuses for winning, and collected a further $11 million from various endorsements. Inspired by Michael Jordan, Wade played for various teams while still in high school, and then made a name for himself in college where he averaged 19.7 points per game. Largely thanks to his performance during the NCAA Tournament in 2003, Wade received a lot of public attention, and again later that year when Dwyane was chosen as the 5th pick in the NBA Draft by the Miami Heat. Wade did fairly well during his first season on the team, yet at the time he was overshadowed by two other star players in the league – Carmelo Anthony and LeBron James. However, Wade did not have to wait long for his breakthrough; during the 2004-05 season, especially the NBA Playoffs, Wade proved himself to be a valuable asset to the team by scoring an average of 26.3 points per game. A year later, Wade with the Miami Heat defeated the Dallas Mavericks to become the NBA Champions, and Dwyane took home the Finals MVP trophy too. Wade played with the Miami Heat for 13 seasons, winning further championships in 2012 and 2013, and averaging over 23 points per game throughout, as well as other achievements already mentioned. He signed a two-year contract with the Chicago Bulls before the 2016 season, after a falling-out with the Heat’s president Pat Riley. For the national team, he won gold medals at the 2008 Beijing Olympics, and the 2006 World Cup. Additionally, Dwyane Wade is a recurring face on many popular magazine covers, including “Esquire” and “GQ Magazine”. Wade is also partnered with such companies as Gatorade, Lincoln, T-Mobile and Staples, whose products he endorses. He has been a guest on several television shows too, among them “ The Late Show with David Letterman”, “Live with Regis and Kelly”, as well as “Austin & Ally” with Ross Lynch and Laura Marano. In his personal life, Dwyane Wade has been married to actress Gabrielle Union since 2014. He was previously married to high school girlfriend Siohvaughn Funches from 2002 through 2010, and has custody of their two sons. He also had a son with Aja Metoyer in 2013.